Today we have sent part of the last shippings. It will arrive in the coming weeks. The rest of the shipments will be placed between this week and the next. Shippings to Belgium and UK have been delivered this morning (please consider that some of them could take one week to arrive). We keep doing our best to end the shipping process as soon as posible. Sorry for the new delay. The books are almost ready to be delivered in the coming weeks, but it´s not posible by now to say something more precise. Thanks a lot again for your patience and in case you don´t agree with this situation please contact us at "brigadacomic@gmail.com"
The schedule for the shippings has suffered a little delay, as for the contract we have with the shipping company, we have to check manually one by one again to add the shipping information (on a sticker) for the French , Italian and Germany destinations (near 400 individual shippings). This delay will affect , unfortunately, to the rest of shippings. For Italy and Germany: between the first and second week of June. Rest of the countries during the third and fourth weeks of June. Spain, Usa and Canada destinations have been already delivered. Sorry for this last minute inconvenience, unpredicted on our plans, and thanks again for your patience. -Shippings to SPAIN + PORTUGAL (ZONE A): All delivered. -ZONE B (France): Still in process. Expected to be delivered next week to the shipping company , and then three to four days to complete all shippings. -Shippings to USA+CANADA: All will be delivered to the shipping company tomorrow May15. Then it´s expected to take a week for the delivery to each customer. -Rest of countries- expected to be delivered to the shipping company last week of May, first week of June. He recibido algunos mails y comentarios sobre el tema de que durante los días del Saló del Cómic en Barcelona hubiera copias a la venta de Brigada#2 en el stand de Librería Universal y en otras tiendas a nivel nacional. Entiendo que haya sido una sorpresa , como mecenas, ver a la venta el comic sin haberlo recibido en casa primero. -El mecenas particular recibe el comic con varios extras, que incluyen el envío a domicilio, y que no estarán disponibles de ninguna otra forma ni en ninguna tienda. -Las tiendas que han recibido copias durante estos días son a su vez mecenas, ya que participaron en la campaña de la misma forma que lo hacen los particulares (como se puede comprobar en la pagina del proyecto en Verkami, donde vienen listados los participantes). -Las tiendas compran packs de libros no para su uso personal, sino para su venta y apoyo de este tipo de mecanismos de autoedición. Siendo las fechas del Saló del Comic uno de los puntos más importantes del calendario para esta industria, y teniendo los libros recien salidos de imprenta (con gran esfuerzo para que lleguen a tiempo a esa fecha determinada), es justo que los libreros tengan la opción de aprovechar esta ocasión. -Los envios a particulares, como se ha descrito en este mismo blog, estan previstos que sean entregados a nivel nacional para la semana que viene como muy tarde. Por el tipo de contrato con la agencia de transportes encargada del reparto, todos los paquetes deben enviarse al mismo tiempo. Esto implica que debamos esperar a tener todos los envios preparados almacenados (más de 500 a nivel nacional) y no podamos enviarlos a medida que los tenemos preparados, algo que por otro lado nos sería más cómodo a nosotros mismos para realizar su gestión. -En ningun momento se menosprecia el apoyo de los mecenas, sean particulares o sean tiendas. Creo que no me dejo ningun punto por comentar. Este post está publicado oficialmente para contestar comentarios recibidos, y para contestar a los que no han protestado directamente, sino a traves de terceras personas, sin haber consultado primero a los responsables. The books are finally here and we are starting the shippings. - Spain, Portugal : they will start the last week of April. -Rest: Last week of May. The shipping process takes a lot of time as we take care of each delivery individually, being just signed or with a drawing, that takes quite some time. But even that, the schedule is going on as planned. Please read carefully this section before send a question that may be already answered here. 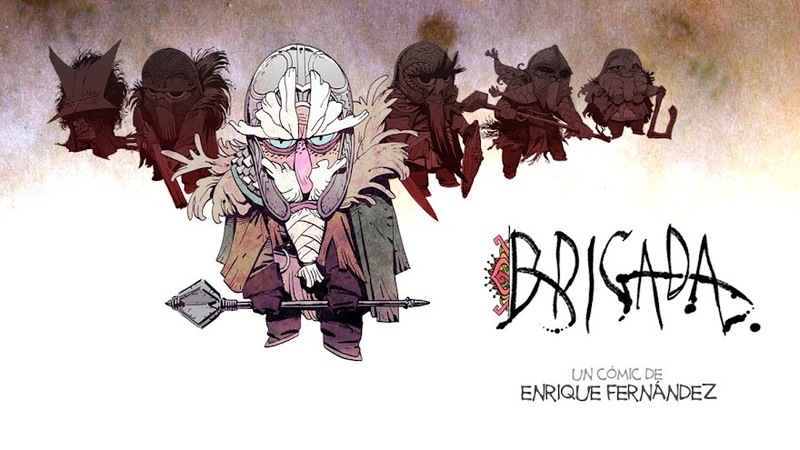 "Brigada" is a comic book series from Enrique Fernandez. It´s self-edited and raised its funds trough the crowdfunding platform "Verkami"on August 2012 for the first issue. The second issue has just succeeded again the same way in January 2013. -Is still posible to buy the book ? -When will be released the book #2 and the extras? The book will be ready to deliver on spring 2015 if not before. -Is the book in english or french? Yes, the book has four release languages: english, french, italian and spanish. The language option will be chosen after preorder. -Is it posible to buy your books to sell them on my bookstore? Yes, there´s an option to have a minimun group of 5 books. -This site is only in english while the edition of the book is also in french,italian and spanish, why? It will help me to focus just on releasing the news internationally the fastest posible way. -How long will be the series? Will you use the same funding way for the next volumes? Yes, the Verkami option has proven to be excellent for this purpose. It´s not easy to tell how many books will have a series before even releasing the first number, but there are three volumes on the first row of scripts.